Photograph of the Great Chaitya Hall at Karli, taken by Charles Scott in the late 1850s. 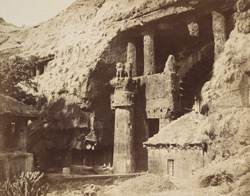 The caves at Karli in Maharshtra and the Great Chaitya or prayer hall were excavated during the phase of early rock-cut architectural activity in India. A courtyard precedes the cave, with a huge 'simhastambha', a column with a bell shaped capital topped by four lions. The facade of the cave has a wide horseshoe-shaped window. The porch cave is adorned with very fine carvings depicting mithunas or amorous couples which date from 1st century BC to 1st century AD.